A sign before the voter registration table can be seen at the Cross Insurance Center in Bangor, Nov. 2, 2016. Last week, Massachusetts became the 13th state, along with Washington, D.C., to adopt an automatic voter registration law. Under such laws, qualified individuals are automatically registered to vote when they do business with the state’s motor vehicle agency. Under the Massachusetts law, adult citizens who sign up for MassHealth, the state’s health insurance for low-income and disabled residents, will also be automatically registered to vote. Residents could opt out of the automatic registration. Nearly 700,000 additional voters could be added to Massachusetts voter rolls in coming years with the change, which was signed into law last week by Gov. Charlie Baker, a Republican. Other states that have implemented automatic voter registration have also seen significant increases in registration. Unless you don’t believe all qualified Americans should have a voice in their government, encouraging more people to vote is a good thing. That’s why Maine should join this trend. Under the National Voter Registration Act of 1993, states were required to allow citizens to register to vote when doing business at motor vehicle and social service agencies. Oregon was the first state to implement automatic voter registration in 2016. Despite the so-called motor voter law, 60 percent of people said they have never been asked to register to vote, according to a 2016 Pew Charitable Trusts poll. Motor voter laws are well intentioned, but still too few people are registering to cast a ballot. According to the U.S. Census Bureau, more than 20 percent of eligible voters were not registered to vote in 2014. Other countries avoid such problems by automatically including eligible citizens on voter lists. In Canada, for example, when someone becomes a citizen or a citizen turns 18, they are added to the voter list. As an added benefit, lists of automatically enrolled voters are more accurate and up-to-date than lists of voters who registered to vote but didn’t update their registration when they moved, for example. 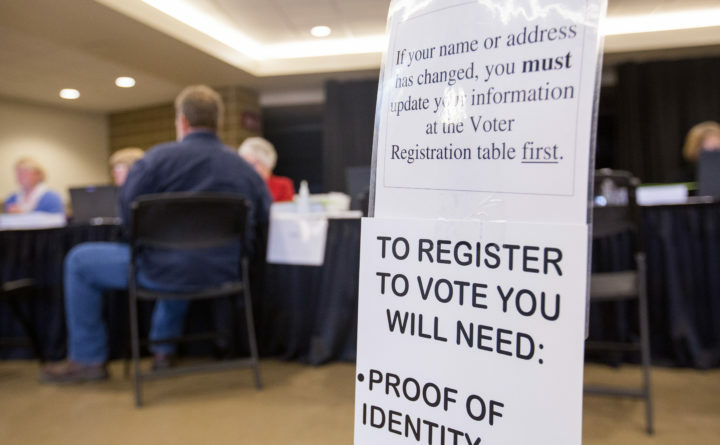 North Dakota is the only state that does not require voter registration. Maine lawmakers considered a bill to start automatic voter registration last year, but it was rejected in party-line votes. This is an idea worthy of reconsideration. Richard Bissell of Bangor told lawmakers that the proposed legislation would help disabled veterans like himself who may have difficulty getting to a town office, which may have limited hours, especially in rural areas. The bill was backed by AARP, the Maine ACLU, the League of Women Voters and Maine Citizens for Clean Elections. Many efforts are underway to make it harder to cast a ballot in America and to gerrymander political representation. Political parties are drawing district boundaries for their benefit, not the benefit of the people who live in those districts. Some Republicans are working to increase roadblocks to voter registration and, sometimes, intimidating groups ( college students are a favorite target in Maine) who traditionally don’t vote Republican. The federal government is backing away from longstanding efforts to ensure that racially motivated impediments to registration and voting are removed. Against this backdrop, states should take steps, as Massachusetts did, to make registering to vote easier. Automatic voter registration does this.